I'M LIA HUBER and I know how easy it is to feel like you’re spinning in a million directions. Like there’s no way (no TIME!) to live and eat the way you want. Well I’m here not only to give you hope, but to give you a path to a richer life. Because when we make the shift in what we eat we wake up to opportunities to be more intentional and authentic in all areas of our life. The great news is, everyone has the capacity to be nourished (yes, trust me, even you!). It’s one part know-how (what is a “healthy diet,” anyway? 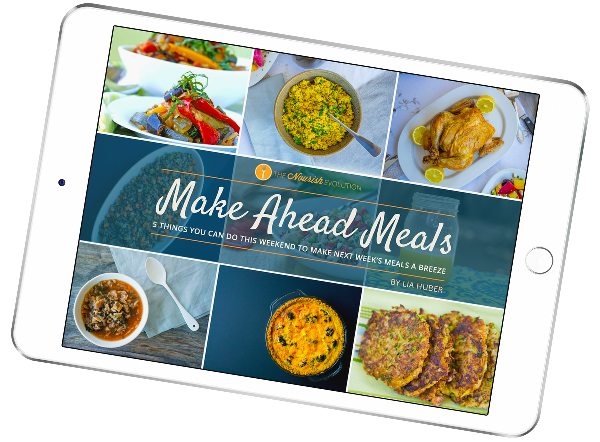 ), one part technique, and one part smart meal planning, wrapped in a repertoire of simple, delicious recipes. I went from a sick, stressed-out veggie hater to an energetic, infectiously encouraging NOURISH evangelist who can’t wait for the eggplant to ripen in her garden. I’d been fighting the same 20 pounds for 10 years (and losing) when I was faced with a one-two punch of a lupus diagnosis and life-threatening cancer scare. My doctor was telling me I needed to eat differently if I was going to live. But I thought I was eating right … I had mastered low-fat spins on my favorite junk food so well that I was contributing to the most popular food magazines in the country (you can read the deets on my professional life here). So I asked the experts—top researchers at Harvard School of Public Health, Tufts, Penn, etc.–where I was going wrong and what I needed to change. I’ll tell you what, not one of them handed me a list of “power foods” or talked about some magic metabolic state. What every single one of them did tell me turned out to be distinctly un-newsworthy. Even more interesting was the addendum each of them added after a pause. They all made the decidedly unscientific observation that eating isn’t just about the food … it’s about the entire experience of eating. They’d found the healthiest people in the world also enjoyed eating. These hard-baked scientists were confirming something I’d glimpsed during my time living in France, Greece and Latin America: That a meal was greater than just the sum of its nutritional parts. I spent the next five years figuring out how to make those naturally nourishing foods into meals that I would crave every day (remember, I was an avowed veggie hater!). I knew that if I didn’t want to eat something, I wouldn’t for very long. I also unlearned a lot of the old paradigms (olive oil is going to make me fat!) that were hindering my ability to change. Five years later, I was 20 pounds lighter, healed of my sickness, more energetic than I’d ever been as an adult, and looking forward to the farmers’ market each week. And then … I became a mom. Suddenly everything I’d learned about what to eat and why became even more important, yet any kind of cushion I’d had with time went completely out the window. With about 30 minutes to get dinner on the table from start to finish, I had to develop a whole new set of skills. It took a concerted effort, but I eventually developed an eating practice. You’ve heard of a “yoga practice” and a “meditation practice,” meaning you develop your skills as you carve deeper into the habit by returning to it again and again and again. Well, eating can be a practice too. I knew what to eat, I knew how to eat, and I knew how to cook the meal within the confines of a busy schedule. And I wanted more than anything to share what I’d learned and shrink the time it would take others to get to this place of being nourished themselves. So I launched NOURISH Evolution. I began speaking on TV and teaching at places like Rancho La Puerta Resort and Spa. I wrote a book, NOURISHED: A Memoir of Food, Faith and Enduring Love (with Recipes), about my journey. Now, I’ve stepped into my life’s calling of empowering people like you to make a lasting shift from processed to real foods, while inspiring a mindset that allows you to fully enjoy all that the shift brings with it. Because you know what? Being nourished is an incredible place to be. It’s like a big bear hug from someone you love combined with the zest of adventure. Buckle up. Because here we go. I’m so glad you’re here. When you change the way you eat, it goes way beyond the plate. SIMPLE MEALS BECOME A SOURCE FOR CONNECTION AND JOY RATHER THAN A CHORE. YOU’RE NOT DEFINED BY WHAT YOU DON’T EAT, BUT BY WHAT YOU DO. YOU’RE NOT HEMMED IN BY SHOULDS AND DON’TS … YOU CRAVE THE FOODS THAT LOVE YOU TOO. 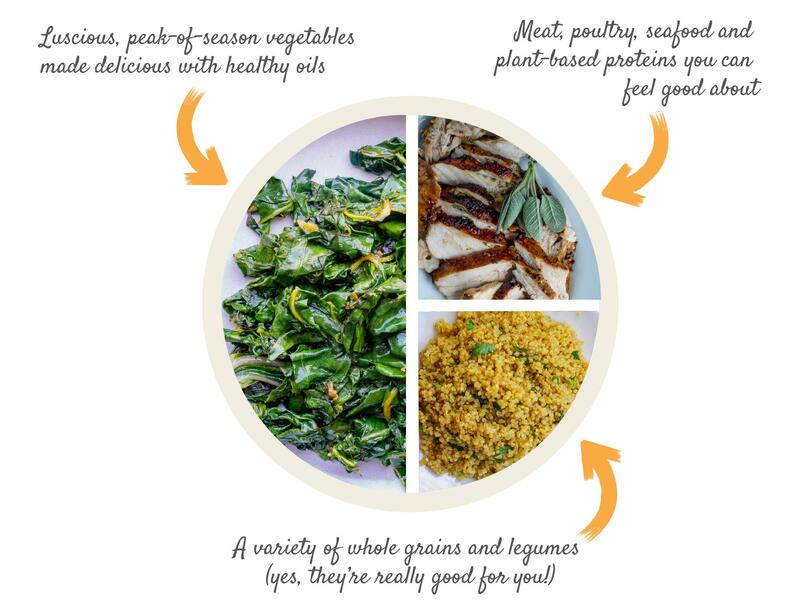 WHAT'S ON A NOURISHED PLATE? THIS PICTURE OF A NOURISHED PLATE stands the test of centuries, of hundreds of studies following hundreds of thousands of people over dozens of years, and cultures the world over. It’s a plate that is weaned of the crutches we lean on and instead coaxes huge flavor from veggies themselves with simple techniques and healthy fats. So even though each of us may have slightly different requirements due to allergies and sensitivities, I look at the nourished plate as a sound foundation to live by and a place to return after periods of exploration. It’s a simple, doable way of cooking, eating and thinking that brings health, wholeness and joy to serve you for a lifetime. And truly, it changes everything. IT MADE IT RICHER THAN I EVER THOUGHT IT COULD BE. Do you want a richer, more delicious life? IT’S MY MISSION WITH NOURISH EVOLUTION TO GIVE YOU THE INSPIRATION, KNOW-HOW AND TOOLS TO GET YOU THERE. FIRST, I WANT TO BE CRYSTAL CLEAR: The NOURISH Evolution isn’t a diet. Rather, it’s a path to build the skills, know-how, practices and mindset to get you confident cooking with nourishing, real foods (because, yes, cooking with real food is totally different than relying on processed food). I’ll tell you more about the how down below. We call this path--this journey--the NOURISH Evolution for good reason. Making the shift from processed food to real food doesn’t happen overnight. It’s an evolution that occurs over time, with effort, intention and belief. In my own experience and over 20 years of working with people to change the way they eat, I’ve identified five well-defined stages we all move through on the journey. This is where everyone begins, eating whatever is in the path of least resistance and having no desire to change. This stage is all about "dieting." There's a desire to change, but not much will or know-how. The Hump is the "something" that moves you beyond diets and towards real change. Often, though not always, it's a "life event." This stage is when we forge our "eating practice," developing new habits through trial and error when making the shift from processed to real food. You know you’re nourished when your default is cooking—and thoroughly enjoying—real food…within the demands and challenges of real life. Where are you on your evolution? Over the years, we’ve listened closely to Nourish Evolutionaries -- those, like you, who are committed to making the journey from processed food to real food and a richer, more delicious life -- and have crafted offerings to help smooth the path. THE NOURISH 10-DAY RESET is for people who know they want to eat more vegetables and less processed food, but don't know how to make that happen. 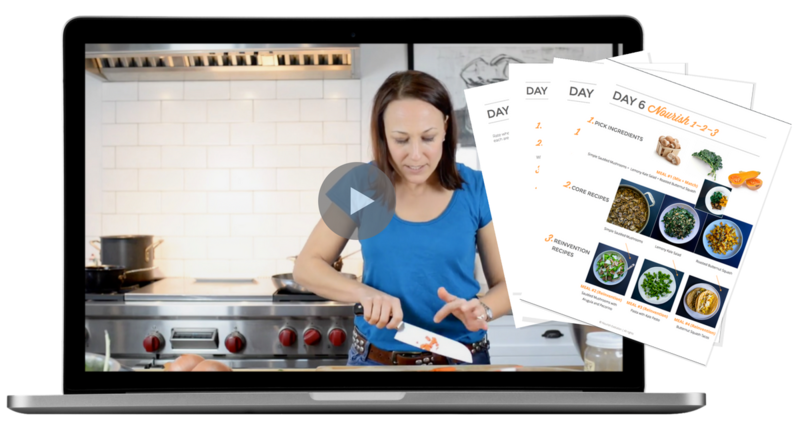 Through daily videos and worksheets, I teach simple skills and techniques that take the stress and hassle out of cooking, and instill the habits and right mindset that make real food possible in real life. 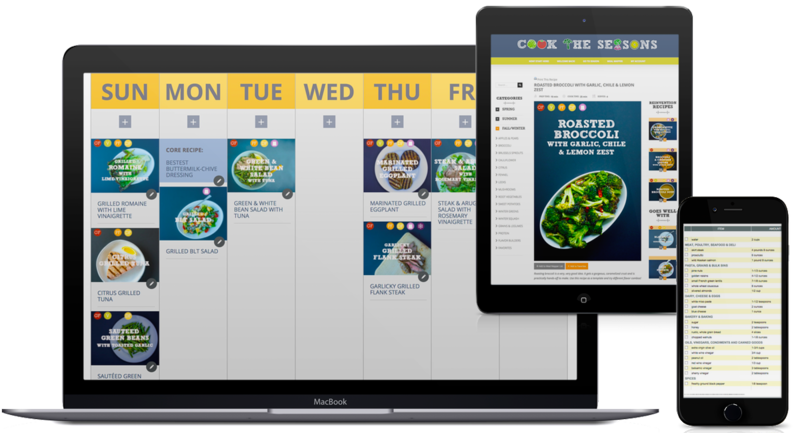 COOK THE SEASONS is a customizable meal planner that puts seasonal vegetables at the center of the plate. Using our NOURISH 1-2-3 approach that strategically repurposes leftovers for easy meals throughout the week, it's a fresh approach to meal planning for people who want a healthier, simpler, downright tastier way to eat. ARE YOU READY TO BECOME A NOURISH EVOLUTIONARY? 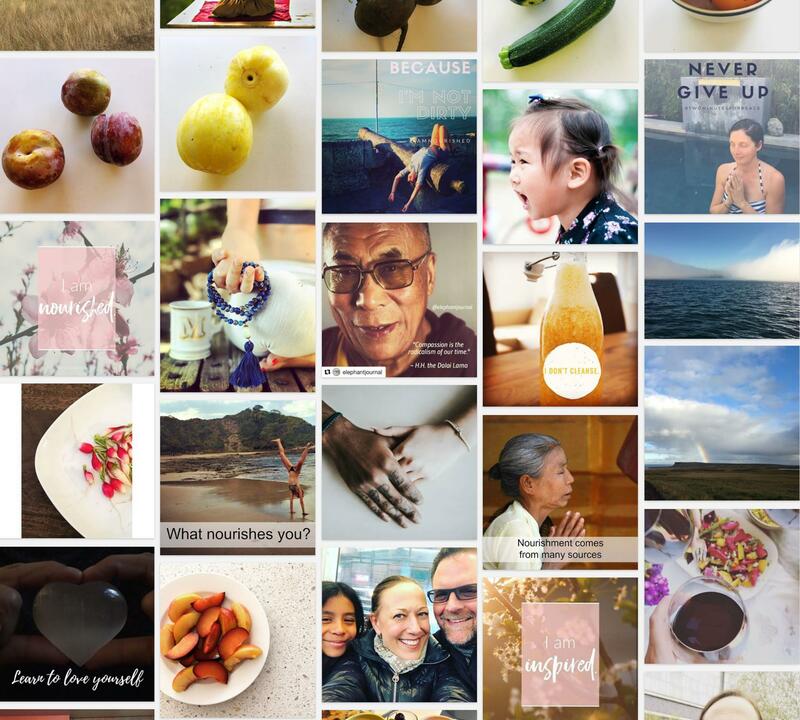 JOIN THE EVOLUTION BY TAGGING #IAMNOURISHED IN ANY OF YOUR FACEBOOK OR INSTAGRAM POSTS! When we're nourished, the "shoulds" of the past become an adventure. When we're nourished, we're feeding not just our body, but a deeper part of ourselves. When we're nourished, there's a deep ripple effect on the rest of our lives, bringing energy, clarity, focus and deep joy.